Thank you Sage Leehey for taking the time to come out to the Haven™ model to find out as much as you could about our miraculous design. 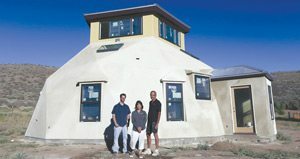 The article in this week’s Reno News and Review, is an in depth explanation of why the Haven™ is holistically sustainable. Only two small corrections we need to mention. The first is that, although our management team won the NCET Governors Cup and Lt. Governors Cup, we did not win the UNR Sontag Competition. Envirohaven was a 2 time finalist for that award; 2012 and 2013. Secondly, the exterior sheeting is not plywood, but a green sheeting made by Jet Board.